harvester can be turned in is ii-foot pathway without declutching. Two 18-foot rows can be harvested by two men in one minute, including the time for unloading and cleaning. The Winnipeg research plot harvester is mounted on a standard ? h.p. 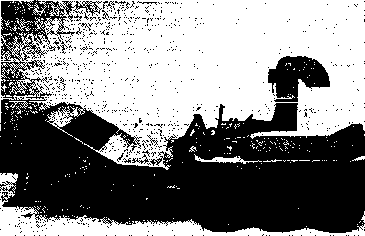 Gravely garden tractor. Modifications were made to the cutting bar to limit the cutting width to two rows seeded a maximum of 12 inches apart. Small wheels were added under the front end to raise the cutting bar to the desired height. The reel, driven from the front wheels, is adjustable horizontally and vertically. As the plot is harvested, the material is gathered in a pan and can be collected and tied by the operator. A small opening was left at the rear of the pan to facilitate cleaning between varieties. A bar was placed across the front opening of the tray, a few inches from the bottom to ensure that the reel will force cut material back into the pan and away from the cutter bar. With this machine, it is possible to harvest 1,000 rod rows daily without the back-breaking labor inherent in the old sickle method. Three men are required to operate this machine efficiently. The BCS binder is a mass-produced farm machine from Italy which is mounted on the front of a European-style walking tractor equipped with a riding sulky. The tractor has a 9 h.p. engine, disc clutch, and a three-speed gearbox, The binder has a 54-inch wide cut and ejects the tied bundles to the rear. The crop remains in an upright position throughout the cutting and tying process. There is a provision for adjusting the size of the bundle, but not for tying height. Because the wheel tread is inside of the cutting width and the bundles are deposited on the stubble remaining where it was cut, adjacent plots are not disturbed. Optional equipment available from the factory includes a differential axle rather than the standard solid axle with wheel release, high-clearance axle, and electric starting. 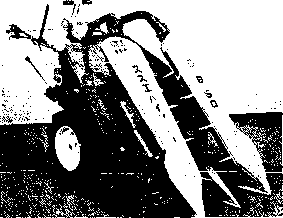 A mower attachment is included with the unit. This self-propelled reaper and binder is suitable for harvesting wheat or rice. It is available from Stmie in three versions: 1-wheel, t-row reaping; 2-wheel, 1-row reaping; 2-wlieel, 2-row reaping. 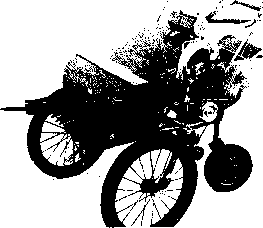 A single-row reaper binder, its 3.85 h,p„ four-cycle, air-cooled, gasoline engine has two forward and one reverse speed. Paddies of all heights ranging from 60 to 120 centimeters can be efficiently harvested. The vacuum blower harvester was developed by the Engineering Research Service, Agriculture Canada to quickly harvest two-row research cereal plots by cutting a minimum amount of material and" transferring the cut material directly into a bag. Attachments at the front hold the cutter bar and act as a pivot for the gathering mechanism. It is supplied with a two-speed transmission and an air-cooled gasoline engine. All functions are adjustable. The Pay liter pneumatic stripper harvester uses a comb to guide standing crops into a cylinder where heads are removed and threshed by the combination of impact from the cylinder and stripping through the comb. 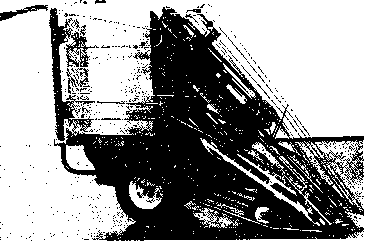 The chaff is removed by an air blast created by the cylinder. The straw is not cut. The unit is self-propelled and has a 24-inch swath extendable to 36 inches by additional crop fingers. The height of the comb is adjusted by a hand crank during operation. 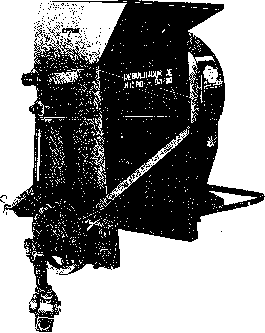 The Poynter box stripper is similar to the pneumatic stripper except that all the stripped material is collected in an 8-cubic-foot box. This type of stripper is used in conjunction with a plot thresher to further thresh the collected material. 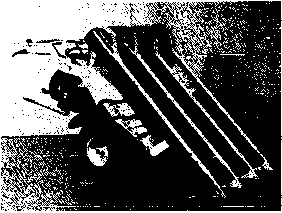 The box stripper is normally hand-propelled, but it is also available as a ¡lower-propelled unit. Monier Metal Products, Ltd, (Quick Harvester) 749 Port Rd. 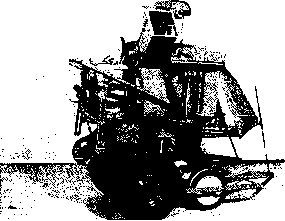 North America, a machine like this might offer ait alternative to the combine harvester.